·For those of you who have children and don’t know it, we have a nursery downstairs. ·Due to the Rector’s illness, Wednesday’s healing services will be discontinued until further notice. ·Evening massage – 6 p.m.
·The eighth-graders will be presenting Shakespeare’s Hamlet in the church basement on Friday at 7 p.m. The congregation is invited to attend this tragedy. ·Potluck supper: prayer and medication to follow. ·Don’t let worry kill you off – let the church help. ·The concert held in Fellowship Hall was a great success. Special thanks are due to the minister’s daughter, who labored the whole evening at the piano, which as usual fell upon her. ·Scouts are saving aluminum cans, bottles, and other items to be recycled. Proceeds will be used to cripple children. ·The outreach committee has enlisted 25 visitors to make calls on people who are not afflicted with any church. ·Low Self-Esteem Support Group will meet Thursday at 7 to 8:30p.m. Please use the back door. ·Remember in prayer the many who are sick of our church and community. ·Pastor is on vacation. Massages can be given to church secretary. ·The choir invites any member of the congregation who enjoys sinning to join the choir. ·Weight Watchers will meet at 7 p.m. Please use large double door at the side entrance. ·The rosebud on the altar this morning is to announce the birth of David Alan Belzer, the sin of Reverend and Mrs. Julius Belzer. 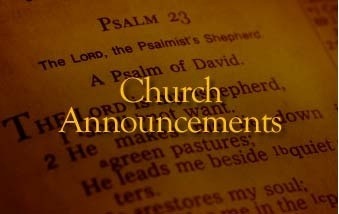 ·This afternoon there will be a meeting in the south and north ends of the church. Children will be baptized at both ends. ·Tuesday at 4PM there will be an ice cream social. All ladies giving milk will please come early. ·This being Easter Sunday, we will ask Mr. Vassilas to come forward and lay an egg on the altar. ·Next Sunday, a special collection will be taken to defray the cost of the new carpet. All those wishing to do something on the new carpet will come forward and get a piece of paper. ·At the evening service tonight, the sermon topic will be “What is Hell?”. Come early and listen to our choir practice. ·Eight new choir robes are currently needed, due to the addition of several new members and to the deterioration of some older ones..
·Please join us as we show our support for Amy and Alan who is preparing for the girth of their first child. ·The Lutheran Men’s group will meet at 6 PM. Steak, mashed potatoes, green beans, bread and dessert will be served for a nominal feel. This got me really Laughing Out Loud, and not just an internet LOL while I don’t even smile.